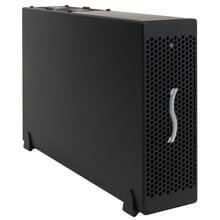 Do you frequently need to hook up multiple USB 3.0 drives for fast backups and drive-to-drive duplication? If you are looking for the best possible performance, install the Allegro™ Pro USB 3.0 PCIe adapter in your Mac Pro® tower, Windows® PC, or Thunderbolt™ 2-to-PCIe card expansion system. This pro Sonnet card adds four SuperSpeed USB 3.0 ports to your computer, but unlike conventional adapter cards, each port has its own controller. Instead of sharing a single controller’s bandwidth, each port gets its own, enabling the Allegro Pro card to support aggregate transfer speeds of up to 1,800 MB/s (450 MB/s per port)! Sonnet specially engineered the Allegro Pro card to provide extra power through its ports without the need for you to connect an auxiliary power cable. 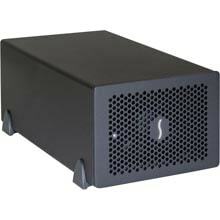 Delivering up to 10W of power per port, this Sonnet solution supports USB 3.0 bus-powered hard drives, SSDs, DVDs & Blu-ray™ devices without the need to connect an additional AC power adapter. The Allegro also supports the USB 3.0 charging specification that enables you to simultaneously charge and sync your iPad®, iPhone®, or other device that supports USB 3.0 charging. Got a Thunderbolt connection, but no PCIe slot? 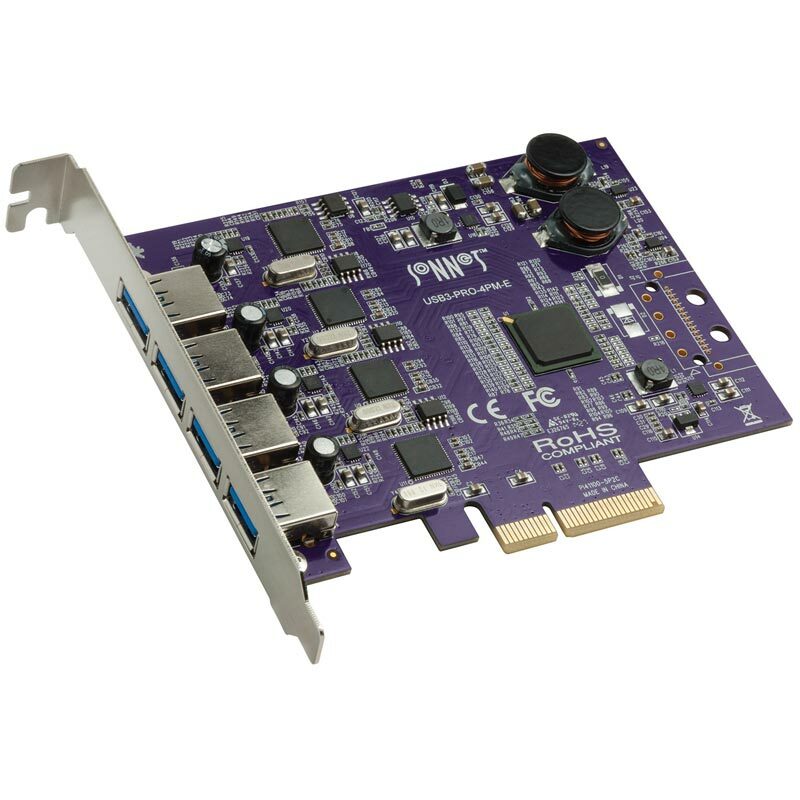 This card is ideal for use in one of Sonnet’s Echo Express™ or xMac™ Thunderbolt 2-to-PCIe Card Expansion Systems—the combo enables you to add four SuperSpeed USB 3.0 ports to iMac®, Mac® mini, new Mac Pro®, MacBook Air®, and MacBook Pro® computers with Thunderbolt ports. Why limit performance by connecting multiple storage devices to your Mac’s built-in USB 3.0 ports? 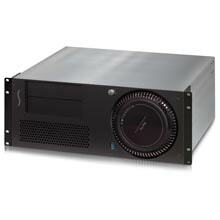 Install the Allegro Pro card into an Echo Express III-D (or other Thunderbolt-to-PCIe card expansion system) and connect it to your Mac via Thunderbolt cable—you’ll add four USB 3.0 ports, each with a dedicated controller, for faster data transfers from media card readers, storage, and other peripherals. When connected to the Allegro Pro USB 3.0 PCIe, Allegro USB 3.0 4-Port PCIe, Tango 3.0 PCIe, or Tempo Duo PCIe card, my bus-powered USB 2.0 or 3.0 drive or SSD will not reliably mount or transfer data.